Anguillitta is particularly impressive because there’s a feature for everybody. A golf course for the active, a pool for the loungers, and a gazebo as a mini retreat. This villa has plenty of space to spread out and would be perfect for a family reunion or group trip. 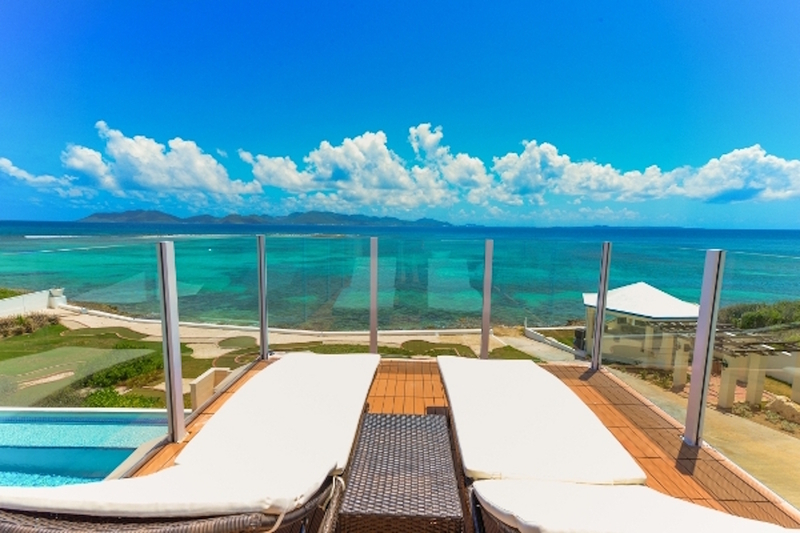 Anguillita sits on one acre of land directly on Blowing Point’s rocky coastline. This fully air-conditioned home enjoys panoramic views and daily housekeeping. A short path leads to the sea, and a miniature golf course sits between the coast and the home. There are multiple areas for reading and relaxing, like a covered gazebo with dining, a rectangular infinity pool with a hot tub, and a large deck with chaise lounges. Stay outside all day by rinsing off in the outdoor shower and cooking on the BBQ grill. Take advantage of the villa’s steam room for a spa experience, and play music from the sound system to enhance relaxation. Workout on the gym’s stationary bike, elliptical, treadmill, vibration fitness machine, weights, and balance balls while watching movies or fitness videos on the 42” Smart TV. A sound system and WiFi run throughout the property. The resort consists of five individual units, but there is a common area with a 75” TV, a library, and an office. Each unit has an ensuite bathroom, private balcony, and romantic views. Dolphin is the largest unit, perfect for families, and located on the ground level. This unit has three bedrooms and two and a half bathrooms. It has lavishly furnished living, dining, and cooking areas that all open to the large balcony by the pool deck. The master suite has a king bed, ensuite bathroom, and pool and ocean view. The other two bedrooms have a full bed and a queen bed, respectively. Each has a 42” Smart TV. Grouper is the second unit, and also sits on the ground level. This one-bedroom unit has a master suite with a 42” Smart TV, an ensuite bathroom, and a balcony. There’s also a sitting area, cozy kitchen, dining area, and living room with a 42” Smart TV. This unit is brightly decorated, just like the fish its named for. The Barracuda penthouse unit has stunning, panoramic views, a king suite, living room, kitchen, and dining area. Snapper is also on the second level and has a king suite and a kitchenette with a small fridge, a 42” Smart TV, a wine cooler, microwave, and a small dining area. Flounder is the fifth unit, and sits near the golf course on the garden level. It has a king suite, kitchen, and large lounge area with a 75” Smart TV. Anguillitta sits between the ferry and Rendezvous Bay, so restaurants and activities are only minutes away. The property is also available for weddings and special events. Anguillita sits on one acre of land directly on Blowing Point’s rocky coastline. This fully air-conditioned home enjoys panoramic views and daily housekeeping. Anguillitta sits between the ferry and Rendezvous Bay, so restaurants and activities are only minutes away. The property is also available for weddings and special events. Guests will be met at the airport or ferry dock and will follow in a taxi (guest expense) to the villa. Miniature golf, use of villa grounds, and kitchen stocked with breakfast items. Signing privileges at CuisinArt Golf Resort and Spa with a reservation for a day use room. $3 per person/per day for guests 12 and older for government levy fee. Car rental, private chef, butler, server, grocery and beverage shopping (pre-arrival and during your stay), liquor and wine delivery, nanny service, baby equipment, spa services, yoga and personal training, photography, and private airport transfer/car service can be arranged for an additional fee.